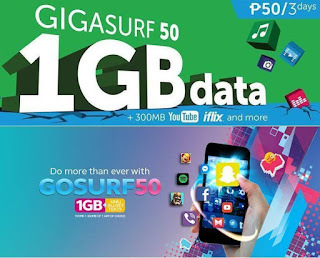 To those who are looking for a budget internet surfing promo on our major telcos here in Philippines we list down few options for your reference. For the amount of 50 pesos you can enjoy browsing up to 3 days with some added free access on selected app, sites and network services. With your Php 50.00 our telcos mostly gives you 1GB of allocated internet data that you can use on your mobile phone, pocket Wi-Fi and USB broadband. All you need to do is load your prepaid SIM card and register it to promo listed below then it’s up to you if you want to insert the sim on other device or on your mobile itself. You can also register above promos via respective USSD menu, for Globe just dial *143# then look for GoSurf50 and for Smart dial *121# select BigBytes 50.